You always hear “these sound like $200 headphones for half the price” when reading headphone reviews. I don’t know about the money, but these things sound amazing. They are true monitor headphones. These are not warm or fun or colored in any way. They have great response and will reveal harsh recordings. They do sound better than any headphone I have ever heard. The clamping on the head is comfortable and the pads for comfortably over the ears. The velour pads feel initially SLIGHTLY warm, but do not heat up like vinyl pads. They start at the same comfy temp for extended times. The suspension system allows for extended use comfort, also. I am really disappointed in all my other headphones I have paid much more for. I bought these over the almost identical Superlux. These come with velour pads and are slightly less. The Superlux has detachable cords but that was not needed by me. Go with these for your monitors and be pleased. Spend the money you save on better equipment elsewhere. You won’t do better than these – different but not better. They are plastic-y but these aren’t for fashion. These headphones are nothing to snuff at. Amazing slightly V-shaped sound with sparkly well-extended highs and deep lows that rumble when it is called for. Detail is top notch and edges out a bit over the Monoprice 8323 but doesn’t quite have the same impact as those headphones, so bassheads may be left wanting. 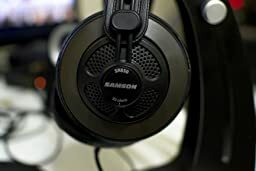 The Panasonic RP HTF600 has a bassier sound that is not quite as lean but is more liquid and smooth than these SR850s. The Pannys compete with the Samsons in terms of the width of the soundstage but the Samsons are much more 3D and have better positioning, clarity, and soundstage in gaming than the Pannys. Well worth the price for an extremely comfortable pair of headphones with great detail and amazing soundstage. Works well as an all-rounder pair of headphones. Just be aware that these headphones are semi-open and therefore leak a bit of sound out and let sound in as well. 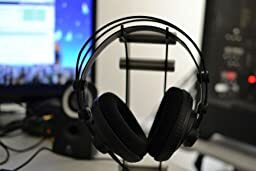 Buy these instead of any gaming headset! These SR850s are my 1st pair of studio monitor headphones and for the price I wasn’t really expecting much but as it turns out, I got more than what I paid for. All you get is the headphones with no carrying case, the gold adapter for the 1/4″ stereo jack that screws onto the 3.5mm tip that’s built into the cable, and the usual warranty documentation. These headphones are VERY comfortable for long editing and/or music sessions. I also wear glasses and I still found them comfortable to wear for over 2+hrs with no problem. The self-adjusting band is definitely not a gimmick. It works perfectly and I don’t have to readjust the headset afterwards as the ear cups never allowed my ears to touch the speakers. The cable is very long and you’ll have no problem being able to move around your work area with these plugged in. The rest of the headset screams “professional use” as it lacks the style of something you would take outside of your workplace. Lastly, the sound is amazing! I’m not an audiophile but I was truly surprised at how clear and detailed the audio is from these headphones. These are not for bass heads but the 50mm drivers makes sure the bass is present and tight. Listening to my music was an amazing experience, especially when listen to O-Fortuna mixes and music with lot of instruments going at once so the soundstage could really shine. I cranked my cheap DAC all the way up to almost 100% and there was no distortion in the audio at all. The low ohm impedance required to drive these headphones means they’ll work on most mobile devices as well if that’s something you wanna do. I have a pair of V-MODA Crossfade LPs and didn’t notice how overpowering the bass was on them till I used these as my primary headphones for a couple weeks daily. I got these for casual listening on my desktop and editing my YouTube videos. They couldn’t do the job any better even if the price was a little higher. For a mere $50 you get great sound and even better comfort.